Italy will miss out on the World Cup for the first time in 60 years as Sweden secured a precious goalless draw that punched their ticket to Russia thanks to a 1-0 aggregate win. 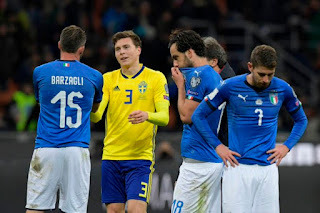 Not since the 1958 tournament, coincidentally held in Sweden, have the Azzurri not been at football's showpiece event, but defeat in Solna in the first leg proved their undoing and surely signals the end of Gian Piero Ventura's disappointing reign as coach. It was a far more industrious effort from the four-time world champions at San Siro than the drab effort produced in the first leg, and visiting goalkeeper Robin Olsen was at his best to keep Italy at bay at the end of a busy first half. But there was no way past Sweden's stoic defence, which held firm to help book the nation's first World Cup appearance since 2006, and – for all of Italy's dominance of possession – the aggregate result could have been more convincing with the visitors denied two decent penalty shouts.